This is just a joke, not male bashing. Take a deep breath and laugh, it’s funny. Sweethearts® share a storied history with our legendary New England Confectionery Company- NECCO® Wafers , which isn’t surprising since their inventors share a bloodline. Daniel Chase created the first conversation hearts in 1866 by devising a machine that would press food dye letters onto the candy lozenges made famous by his brother and NECCO® founder Oliver Chase. NECCO (New England Confectionery Company) is the oldest continuously operating candy company in the United States. It was founded in 1847 when Oliver Chase invented the first American candy machine. NECCO produces its entire assortment of candy at the company’s headquarters in Revere, MA. Popular brands include: the beloved NECCO Wafers, the Valentine’s Day staple Sweethearts, and other iconic brands such as the Clark Bar, Sky Bar, Canada Mints, Candy Buttons, Mary Jane, and Haviland Thin Mints. 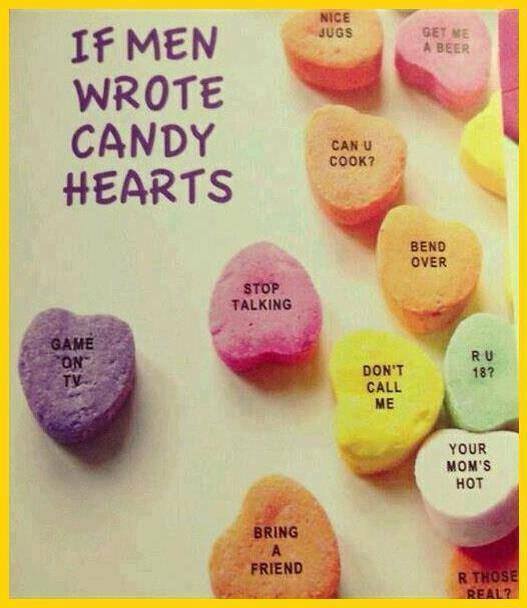 This entry was posted in Humor and tagged blogging, Boston, candy, humor, joke, laughter, musings, NECCO, Photo, Photography, valentine by simplygiselle. Bookmark the permalink. These are too cute. And thanks for including the Necco candy history! I love all those candies so much. I found it sort of funny and wanted to share…. glad you found the humor in them too 🙂 I live in N.E. so I thought I would pass along a little info while I was at it. *know(not low). Annoying auto correct! NECCO also makes these candies that are like powdery coins in a wax wrapper. Many people don’t like them but my fav is the pink because it takes like pepto bismol….LOL.. Do you not sell them where you live? No..I haven’t seen them. If there are, they’ll be under the “imported” stuff and the prices are at least 3x higher than elsewhere.